Quick Reads was launched in 2006. We work with well-known authors to write short and engaging books that are then distributed across libraries, prisons, colleges, hospitals and adult-learning organisations. They are also available in bookshops across the country. Since 2006, over 100 Quick Reads titles have been published; the books have been loaned more than 5 million times through libraries and over 4.8 million books have been distributed. The initiative has established a reputation for publishing top quality bestselling authors, including Andy McNab, Jojo Moyes, Jeffrey Archer, Malala, Roddy Doyle and many more. 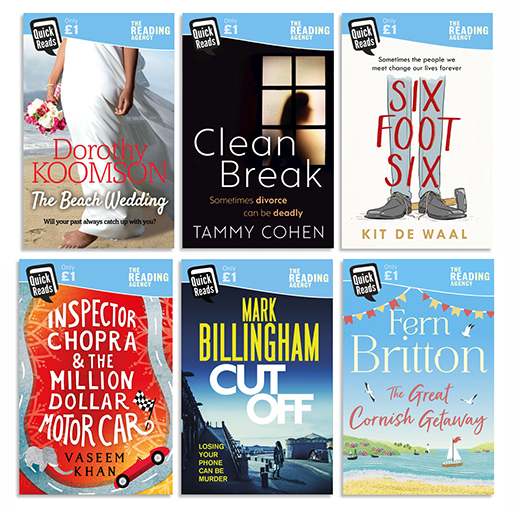 2018's brilliantly varied list featured books by Dorothy Koomson, Tammy Cohen, Kit de Waal, Vaseem Khan, Mark Billingham and Fern Britton. This year, after announcing we had been unable to secure financial support to keep the scheme going, we were stunned to receive an incredible gift from best-selling author Jojo Moyes (Me Before You), who generously offered us three years of funding for Quick Reads. The money will allow us to continue the scheme and relaunch a new and improved list of Quick Reads in 2020. We are currently busy working on the next list and a re-launch of the programme. In the meantime, Quick Reads won't be going anywhere: the books continue to be used by prisons, colleges, NHS hospitals, adult learning organisations, trade unions and other partners, and publishers will also make titles available for purchase in bulk quantities to learning providers. The books will also remain available for anyone to borrow from public libraries. Watch this space for more news on the 2020 list. •	Hold a reading break or start a reading group in your workplace, college, library or local community. You can create a buzz about reading that will encourage even the most reluctant readers to pick up a good book. •	Set up a reading area at your organisation. You can provide a bookcase and a reading area if you have room. Use new books or ask people to donate their books. •	Use Quick Reads as part of Reading Ahead, which challenges people to pick six reads and record their reading in a diary to get a certificate. •	Hold a book swap by encouraging people to bring in books they have read and enjoyed to share with others. You ask people to write reviews or put stickers in the front of the books for people to write comments. The Reading Agency appreciates the continued support of our network. To donate to our programmes, please click here. 1 in 6 adults struggle to read and 1 in 4 people will experience a mental health issue at some point in their lives. Our work tackles adult literacy, mental health and social isolation through the power of reading. Find adult reading materials including free promotional packs and incentive items. Find Readers' Guides and resources for your reading group in our Resources section. Your donations will go a long way to helping us improve children's literacy. Find out how to give here.